We are in the process of redoing our living room. Right now we’re painting. I was actually supposed to be painting when I came up with these nails. First I picked out five polishes that I liked together and painted each finger a different color. 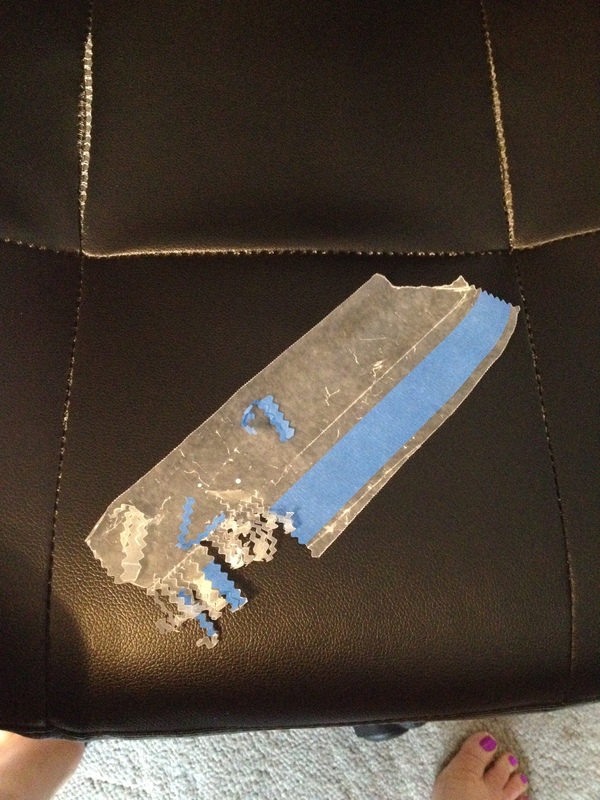 Then, while my nails were drying, I took a piece of wax paper and stuck about a 10 inch piece of painter’s tape to it. Then I took my zig-zaggy crafty scissors and snipped the tape into a bunch of little strips. 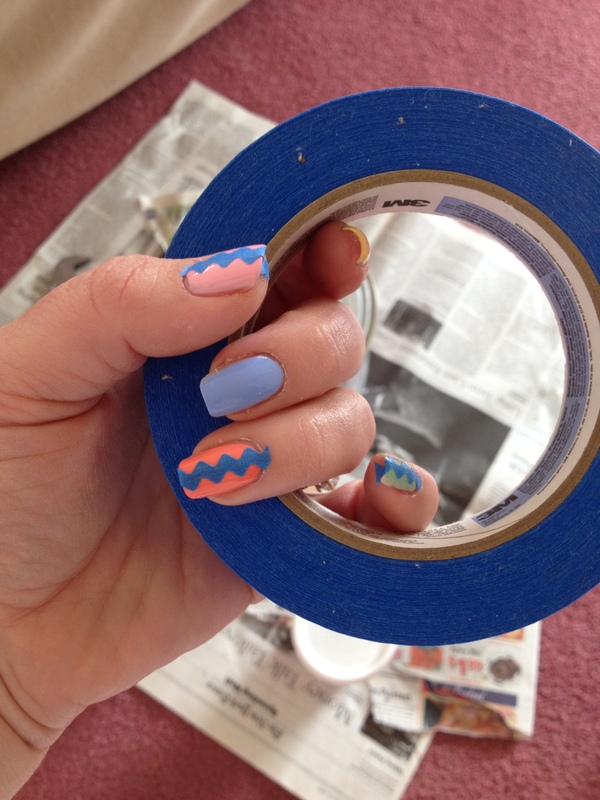 When my nails were really dry, I stuck a strip of my zig-zag cut tape down the center of each nail. Then, one nail at a time, I painted the sides of each nail a different color. I brushed a pretty thick coat down the sides of the nails because I wanted it to cover the polish that was underneath in one coat. As soon as I painted both sides of the nail, I pulled up the painters tape with tweezers. You don’t want to wait until the polish is dry, or the polish will come up with the tape. The colors on my nails look pretty random, but there actually is a pattern. I lined up my polishes in this order: pink, yellow, periwinkle, coral, green. For the sake of ease, let’s just number them 1 – 5. I painted my nails with colors 1-5, starting with my thumbs. 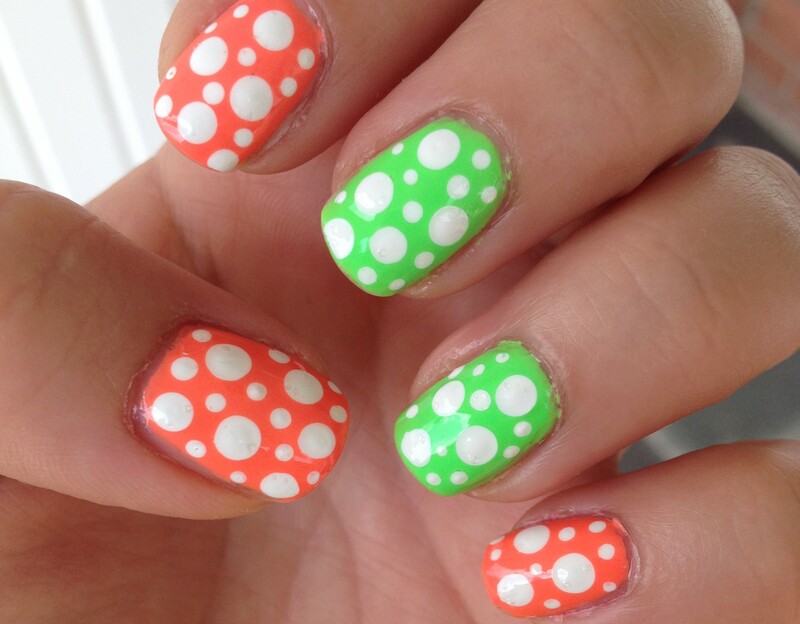 on the sides of my thumbs, I used colors 2 and 3. On my first fingers, I used colors 3 and 4, on my middle fingers I used 4 and 5, on my ring fingers I used 5 and 1, and on my pinkies, I used 1 and 2. I topped these with a quick dry top coat, and I loved how glossy they looked! I sort of felt like the end result looked like a pinata, but I really liked it! The colors were soft enough to keep them from looking obnoxious. These nails actually got a ton of compliments and they really weren’t hard at all! I will definitely be using this technique in the future. Thanks for reading! I hope this inspires you to fancy up your nails. 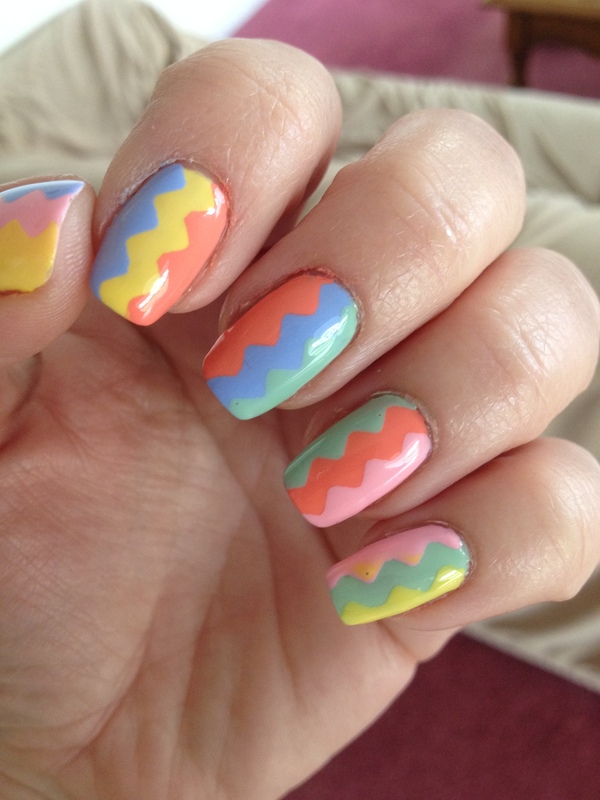 This entry was posted in Nail Tutorials and tagged chevron, nail art, nail tutorial, nails. Bookmark the permalink. Cool! I love the design and colors. I just love this n/a design, colors and the zig-zag look!! I really like the pastel colors of whatever brand polish you have. They aren’t too subdued or too bright. I found a male friend who I think likes crafts and he was thrilled when I suggested showing him what I had learned about nail art. That is probably a design he will like and I don’t even know what color range he will choose but his nails are huge compared to a woman’s small nails so he has plenty of room to make a statement! I hope your painting goes smoothly and am sure it will be gorgeous when done. Oh, yeah! You’re absolutely right!